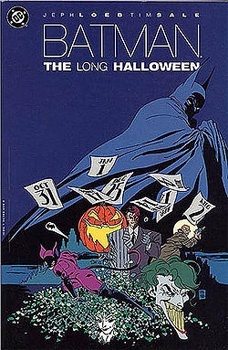 The man behind Heroes and Batman: The Long Halloween is now in charge of Marvel's TV division. Marvel Comics has had a large television presence for a while, largely with animated shows produced for a variety of networks. The Disney-owned publisher has formed a new division for television programming and named comics scribe Jeph Loeb Executive Vice President, Head of Television. Loeb's rÃ©sumÃ© makes him sound well-suited for this role: The man's been a Hollywood regular for quite some time. He's also authored some incredible comics, including Spider-Man: Blue, Superman For All Seasons and Batman: The Long Halloween. Of course, Loeb's work isn't without some notable stumbles like Teen Wolf Too, as well the recent awfulness that was The Ultimates 3 and Ultimatum. Marvel has dramatically increased its presence in the entertainment industry over the past few years. Aside from its wildly successful films and various cartoon series, the company has released a series of animated direct-to-DVD movies like Planet Hulk, Next Avengers: Heroes of Tomorrow, and Doctor Strange: The Sorcerer Supreme. As a result, it's not surprising that Marvel has set up an internal division to deal with this sort of content. Usually, news like this is accompanied by an announcement of upcoming programming projects. Neither Marvel nor Loeb hinted at anything like that, but it's probably safe to assume that something's in the works. I'd love to see Loeb greenlight a TV adaptation of Spider-Man 2099, but that's just me. How about you? What would you like to see Marvel put out for the small screen?